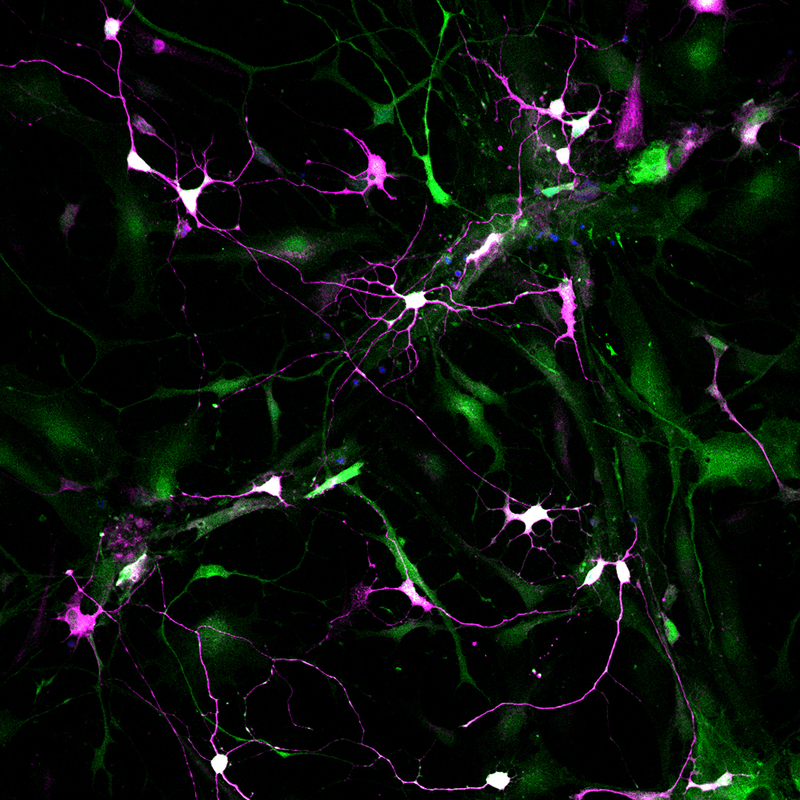 Most pericytes in which both factors, Ascl1 and Sox2, are expressed (green) transform into morphologically-complex neuronal cells (magenta). It was already in 2012 that a team of scientists headed by Professor Benedikt Berninger first succeeded in reprogramming connective tissue cells present in the brain into neurons. Up to now, however, it was completely unknown which intermediate states these cells known as pericytes pass through in the process, and how relevant these states are for successful reprogramming. Berninger and his team have now discovered that on the way to becoming neurons pericytes need to go through a neural stem cell-like state. They succeeded in manipulating the signaling pathways in this intermediate state, which enabled them to either activate or inhibit neuronal reprogramming. The discovery may be the key to future possibilities of regenerating diseased brain tissue by directly reprogramming non-neuronal cells into neurons. The findings were recently published in Nature Neuroscience. Pericytes regulate the diameter of small blood vessels in the brain. They are also involved in maintaining the blood-brain barrier and in wound healing. Professor Benedikt Berninger was now able to demonstrate that the targeted introduction of two proteins active in the cell nucleus, i.e., Ascl1 and Sox2, causes pericytes to assume the form and function of nerve cells. Both proteins are so-called transcription factors determining which sequences of DNA are turned on or off in a particular cell and thus the cell’s form and function. When these two transcription factors are introduced into pericytes, they initiate their conversion into neurons. "To date, however, we have been completely in the dark as to whether these cells go through distinct intermediate states during this transformation process, and how important these states are to the outcome of reprogramming," explained the lead author of the paper, Dr. Marisa Karow, a member of Berninger’s team in Mainz and now a team leader at the Biomedical Center Munich at Ludwig-Maximilians-Universität München (LMU). "By analyzing the activity of genes in single cells, we were able to discover the developmental trajectory of the reprogramming process at the molecular level," added Professor Barbara Treutlein, a Max Planck team leader in Leipzig and Dresden. The Mainz-based researchers and their cooperation partners in Saxony and Bavaria discovered that the cells must pass through a stem cell-like state during the transformation from pericyte to neuron. In the stem cell-like state, important signaling pathways are either inhibited or activated. "By manipulating these signaling pathways, we were able either to inhibit or to stimulate reprogramming to form neurons. On the one hand, this is an important piece of evidence that this state is functionally significant. On the other hand, it provides us with new ways of increasing the success of reprogramming," concluded Karow. "We also found that, once past the stem cell-like state, the cells differentiate into two classes of neurons, i.e., excitatory and inhibitory," explained Berninger. "We hope this discovery will allow us to subsequently enhance targeted reprogramming of cells into specific neuronal subtypes." The new findings indicate it might be possible in the future to regenerate diseased brain tissue by means of the direct reprogramming of non-neuronal cells into neurons.